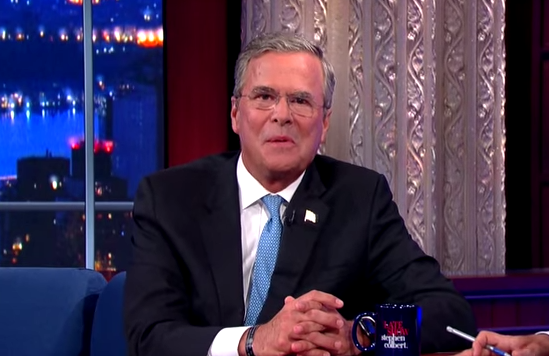 Last night Jeb Bush was a guest on Stephen Colbert's premier of the Late Show. When Colbert tried to help him "prepare" for the upcoming Republican debate, Stephen changed it up a bit wherein Gov. Bush had to read off a teleprompter with "Trumpier" comedic answers (à la Donald Trump). When Bush heard this game-change he responded with, "Oh, this could be dangerous ..."
Immediately after saying "dangerous" during 1:04 - 1:05, Jeb displays what is known as a "Jaw Confessional". This very telling and under-appreciated nonverbal signal is brief. In this example it lasts slightly less than a second and thus here is classified as a "near-microexpression" (although jaw confessionals can be even shorter in duration - and therefore a classic microexpression). A jaw confessional is a short-lived and subconsciously initiated sideways (lateral) movement of the jaw which accompanies the emotion of embarrassment. Here his embarrassment is not for something he did - but for an anticipated action. Therefore in this scenario, Mr. Bush's verbal and nonverbal messages are highly congruent - and thus very sincere. Yet in many day-to-day settings you may very well see this body language displayed with confident (contradicting) verbals - and in such a scenario it would indicate deception. Often the jaw confessional is seen with no accompanying verbal language at all. It's profoundly important to note, whenever the verbal and the nonverbal messages are disparate - it's the nonverbal which is always telling the truth. Take heed though - for significantly slower and longer lateral duration jaw movements have a completely different meaning (What do these indicate and can what other accompanying nonverbals help to differentiate it?). Of course another very common signal of embarrassment and more recognizable by most people seen in this moment is Jeb Bush Blushing.